A cellular base station with 128 antennas may soon help some mobile operators serve many more subscribers in crowded areas. Nokia demonstrated the technology, called massive MIMO (multiple in, multiple out) with Sprint at Mobile World Congress on Monday. It’s one of several types of advances in LTE that could eventually come into play with 5G, too. Massive MIMO uses a large number of small antennas to create dedicated connections to multiple devices at once. In this case, the base station has 64x64 MIMO, or 64 antennas each for upstream and downstream signals. In Nokia and Sprint’s tests, it increased the capacity of a cell by as much as eight times for downloads and as much as five times for uploads. For the demonstration, the base station connected with eight commercial, off-the-shelf phones behind a wall of Nokia's booth and streamed data to and from them. 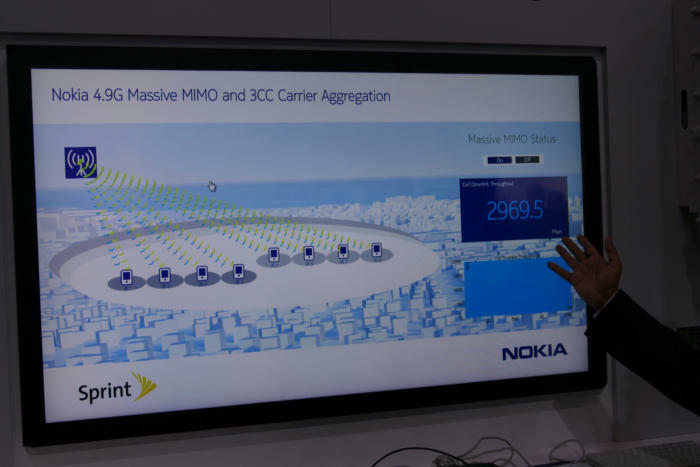 A diagram in Nokia's booth at Mobile World Congress showed how a demonstration of massive MIMO worked, on Feb. 27, 2017. The system isn’t designed to give users dramatically higher speeds but to help give users better access to the capacity of a cell. Typical base stations today have 2x2 antenna systems with just two antennas each for uploads and downloads. Rather than everyone in an area sharing those few antennas, they’ll be able to get their own lanes. Sprint is jumping on this technology, planning trials soon and commercial deployment soon after, because it’s uniquely positioned among U.S. carriers to use it, said Gunther Ottendorfer, Sprint’s chief operating officer of technology. For one thing, it’s the only operator in the country with commercially licensed frequencies high enough, at 2.5GHz, to take advantage of massive MIMO at this scale, Ottendorfer said. (In trials, some other carriers are using massive MIMO with other types of frequencies.) Because the size of antennas is defined by wavelengths, higher frequencies mean smaller antennas, so a 64x64 system for more typical cellular frequencies would be too big to be practical. Sprint already uses 8x8 MIMO in some of its antennas, the closest thing to massive MIMO on a U.S. carrier network. Also, most current phones could use the system with Sprint’s 2.5GHz LTE network because it has a way of organizing frequencies that most U.S. carriers don’t use. There won’t be a standard for achieving the same thing with more typical phones and networks until next year, Sprint says. But Sprint isn’t the only carrier that has these two advantages. So does China Mobile, and Nokia has been testing 64x64 massive MIMO with them, too, said Ashish Dayama, head of MulteFire and TD-LTE marketing at Nokia. The highlight of what the company’s demonstrating with Sprint is that it’s commercial hardware, downsized through cycles of development into something that can go on a real-world cell tower, Nokia says. 5G will take massive MIMO even further, using much higher frequencies such as 28GHz. There’s a lot of spectrum up in those bands to deliver even more capacity, but only in relatively small areas, said John Saw, Sprint’s chief technology officer. At that point, the 2.5GHz network will offer better coverage and will probably serve as an anchor for the 5G network, he said.